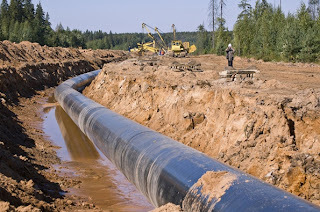 Liquefied natural gas pipeline near Warrenton, Ore.
Who is Oregon LNG? Its backers are a New York-based investment group called Leucadia Corp, operating locally as Oregon LNG and planning to use the Skipanon Peninsula site as an export terminal, in the City of Skipanon, at the Youngs Bay River, essentially at or near the mouth of the Columbia River. I think stopping Oregon LNG would be a goal of tribes in both Oregon and Washington both near and not so close to the Columbia: Chinook Indian Nation, Oregon Coastal: Clatsup and Nehalem Confederated Tribes, further inland Celilio-Wyam Indian Community, Confederated Tribes of the Umatilla Indian Reservation: Cayuse, Umatilla, Walla Walla, Confederated tribes of Siletz Indians. This export LNG plant could negatively impact fishing. Due to security requirements, it could ban fishing and other boats on the Columbia for specified times and distances from the LNG tankers and more. Also any such LNG export terminal, would be exporting 1/7th of the daily amount used across the US in each shipment from the US, with hundreds of shipments planned each year. Also the proposed LNG Terminal, I believe is being built on land that was, for the most part, filled in. I base this on looking at old maps which did not have a peninsula at the current location or a much much smaller one, so one wonders how stable it would be. This terminal roughly a mile from the center of what is the City of Warrenton and the Skipanon runs through the Center of the City of Warrenton. Our home on the Skipanon River has otter, eagles, dear, heron, raccoons and many other animals and is only about one mile from the proposed LNG plant. Our home is at a bend in the river and we have had excellent views of hunting pairs of eagles on a regular basis along the river. Our home is also only about two blocks from the Warrenton City Hall and its one street downtown area. A number of years ago, I attended a Warrenton City Council meeting where the City Council accepted a statement from the initial LNG folks wanting to build an Inport LNG terminal that off loading LNG was no different than offloading boxes, ignorant to the dangers it presents to residents. I was shocked and dismayed then as I recall that at that time the Warrenton City Council voted to allow such a terminal and/or change the zoning to allow such a terminal on that flimsy basis, that the off loading of LNG was no different than off loading boxes. It is my understanding that those large LNG tanker ships will also be off loading water ballast from their LNG ships into our water, at what point I do not know which seems dangerous for our aquatic life. Also the LNG Terminal at the mouth of the Skipanon River in Warrenton, Oregon plans to send hot water under the Skipanon Creek which I believe would heart up the waters of the Skipanon, a tidal river that rises and falls roughly 8 or more feet. That heated pipeline feeds to a City sewer plant that will process and send that water into the Youngs Bay at the mouth of our Skipanon River and at a point where the Youngs Bay waters feed into the Columbia near its mouth. Also since it would be sent through the City Sewer who knows what may be sent through those pipes into the waters, besides water itself as what they send off would be mixed with all Warrenton Sewer so may not be identifiable to that LNG Terminal. Why is a U.S. company sending US and Canadian LNG overseas? Because overseas interests will pay way more than U.S citizens pay for LNG at this time and those companies want to profit with no concern for the destruction to our air, water, land, health, aquatic/fish, etc. If this export terminal is allowed to be built and export our natural resources, not only would there be risks to lives, aquatic, fish, spawning and limit on use of the Columbia, but there would be a new terrorist target. Also, it will raise costs of goods and services and cost of LNG to a nation already suffering from unemployment. FERC’s deadline for public comments is extended to Dec. 24. Comments should be filed electronically through the website www.ferc.gov or mailed to FERC at 888 First St N.E., Room 1a, Washington, D.C., 20426.